Do you and your dog dread bath time? 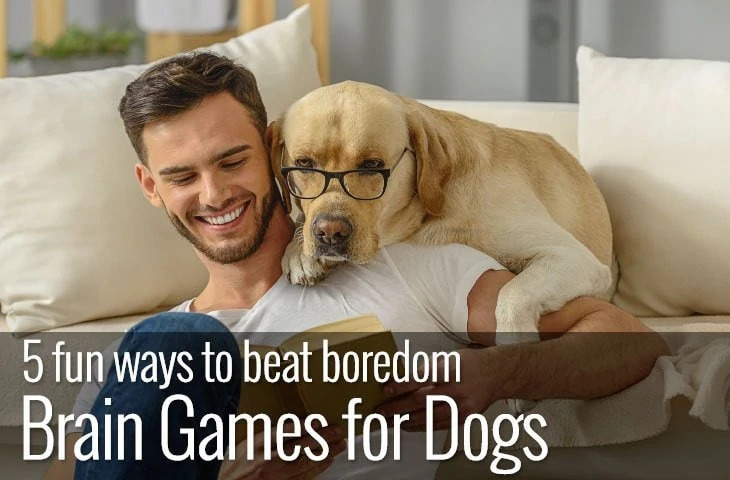 It can be a battle, especially with a large dog. Not only is it a challenge to get your dog in the tub in the first place, but then you have to find a way to keep them there until you’ve finished. And that’s just half the job. Once you et your dog out of the bath, there’s the clean-up afterwards. While mopping the floor isn’t the worse job in the world – a scratched bath is much more troublesome. So how do you keep your dog clean without forking out for a professional wash and brush up each time you want a spotless dog? Well, portable dog bathtubs might be the ideal solution. Unfortunately, the effort it takes to clean some dogs is enough to stop many people from bathing their dogs as often as they should. Add this to the fact that many dogs don’t enjoy a bath and you’ve got an unhappy owner as well as a stressed dog. While you can do a lot without a tub there’s no substitute for a good scrub in a bath. So, portable dog bathtubs offer a useful solution to an age-old problem. 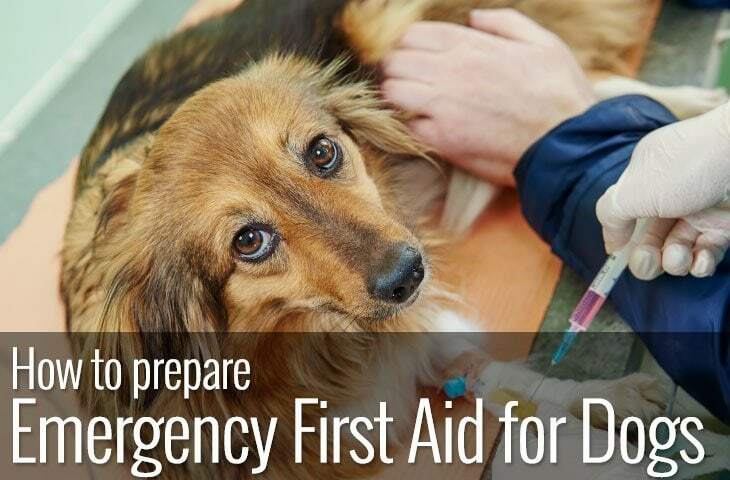 Not only do they keep your house from becoming a flood zone but as many dogs are less stressed when bathed outdoors. Not only that but your drains will thank you for not filling them up with dog hair. Although there are many choices when it comes to containers, they primarily work in the same way. They contain your dog in a unit that you can fill with water. Some tubs come with a shower attachment too and provide an all-in-one bathing system for your dog. While you may already use a shower head to wash your dog, these hose attachments offer a way you can take it outside. 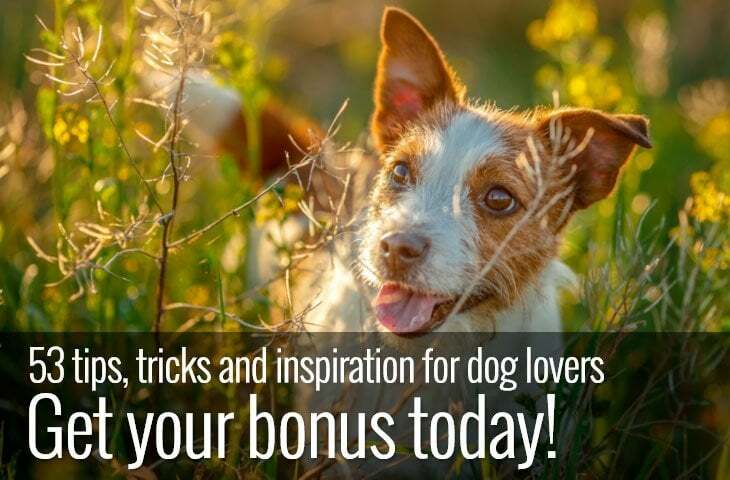 They connect to inside and outside taps and provide a dog appropriate spray pattern. Having to lift a large dog in or out of a bath or bending over a tub to wash a small dog can play havoc with your back. It’s no fun to eventually straighten up only to find that your back is twinging. If your dog already has a negative association with bath time, it can be challenging to overcome. However, changing the environment can help the process. Not only that but most dogs are less stressed when bathed outside. Let’s face it when our dogs roll in something smelly the last thing we want to do its traipse them through the house. 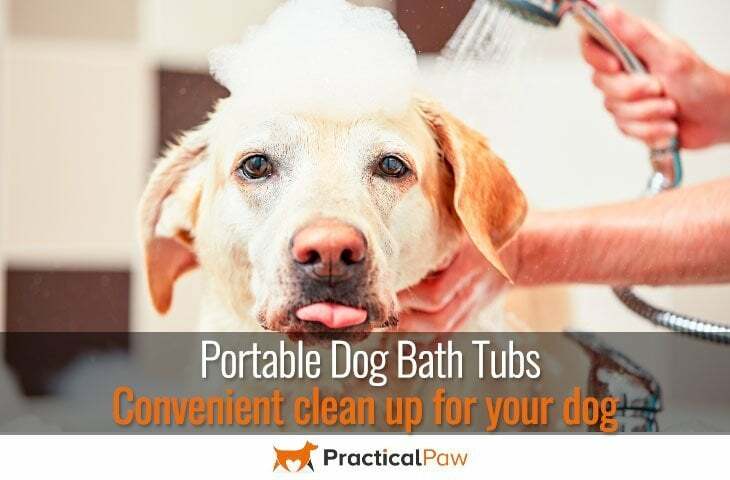 Whether you’ve got a working dog, a dog walking business or just a dog that enjoys smelly stuff portable dog bathtubs offer a convenient and time-saving way to clean your dog. What’s more, keeping your dog out of your own tub means fewer blocked drains, a clean and tidy bathroom and less damage to your tub. This elevated bathtub is perfect if you want to avoid a bad back. 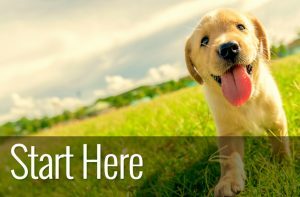 It allows you 360-degree access to your dog, all without bending down. The plastic is sturdy, and the legs snap on and off for more accessible storage. It comes with a spray nozzle with fan spray that can be hung on the side of the tub when not in use and there’s a shampoo caddie which is a nice touch so that you can be hands-free as much as possible. Safety features include a 3-point restraint system and a non-slip rubberised mat to keep your dog from sliding around. The drain hole allows you to empty the tub without getting wet and it’s easy to put together. While not included there’s a step system Booster Bath Steps for Dog Bath that means your dog can walk into the tub. If your dog doesn’t mind the noise of the vacuum cleaner, this mess-free offering from Bissell is ideal. Working in a similar way to a carpet cleaner, the Bissell uses a no-rinse shampoo and water mix to clean your dog’s coat while simultaneously sucking up water from your dog’s fur into a separate tank. If you want something truly portable, then the Bissell BarkBath fits the bill. You can take it and use it anywhere there’s an electrical outlet without having to worry about the mess. It comes complete with no-rinse shampoo, a mat for the unit to sit on to dampen the sound as well as a microfibre cloth for face and paws. Bailey Bear Porta Tubby Collapsible Portable Foldable Dog Cat Bath Tub, Expandable Grooming Washing Accessory For Small Medium Pets, 31.5"x17.3"x8.7"
SAFE & DURABLE DESIGN: Made from 100% high quality & easy to clean silicone. Non-slip bottom & anti-skid legs ensure stability when washing. If you’re looking for a space-saving tub and have a small dog, this useful model folds down for easy storage. Although it can go on the floor, it also fits inside a standard tub and will protect the surface while you save water. It’s perfect if you want to travel and have a way of washing your dog without worrying about damage. With two handy storage trays and a quick drain plug, the BaileyBear Tubby is to easy to clean silicone and has anti-slip legs as well as an anti-slip bottom for your dog’s safety. For dogs with thick coats, the Waterpik shower attachment is perfect. It can be used both inside or outside – attached to your shower or a hose. It has a robust water comb spray that penetrates even the thickest fur along with a narrower spray for delicate areas like the face. The contoured wand makes wetting and rinsing your dog a breeze, in addition you can customise the water pressure, so your dog remains comfortable throughout bath time. While it can stay fixed to your shower and used by way of a diverter tap, you can also keep it portable and use it with your garden hose when the weather is warm. LARGE: Diameter of 50 inches and 12 inches deep. For large dogs, this collapsible pool is probably the best option unless you want to fork out for a professional bathtub. While you still have to bend to wash your dog, it does mean that all the mess stays outside and if your dog loves water, it can be used as a doggy pool when it’s not bath time. The Pet Pool has a drainage hole that works well with minimal tipping to get the last of the water out and with a bit of muscle, also it folds down into a surprisingly small size. The tub is ready in seconds and is made from a sturdy (but not indestructible) PVC material with cardboard inserts to keep the sides upright and stable. Most importantly, durability, ease of use and the comfort of your dog are paramount when bathing your dog. We like the Booster Bath Elevated Pet Bathing Large as it fulfils all of those criteria and more. Not only does it allow you to clean your dog without breaking your back, but the safety features also help keep your dog in place while you work. For extra-large dogs that enjoy bath-time, you can’t beat the FrontPet Foldable Large Dog Pet Pool Bathing Tub as it gives both you and your dog plenty of room. And for small dogs, the BaileyBear Porta Tubby is hard to beat for ease of use and portability.